The quantity theory of money attemps to correlate the quantity of money in circulation with the level of prices, trying to predict how variations in the former variable will affect tha latter. This discussion was first raised by British mercantilists of the 16th and 17th centuries who desired to determine the policies that would increase British exports and secure a permanent trade surplus. Gradually, the discussion was taken over by second-rate mathematicians and wannabe physicists who, coveting the distinction acquired by Physics from the use of mathematics, they tried to translate those discussions into equations; usually copying the ideal gas law—thermodynamics was a very attractive object of methodological plagiarism. Finally, for a variety of reasons, these second-rate mathematicians prevailed—why they prevailed and why they were second-rate mathematicians is another issue. Today, the accepted “common sense” proclaims that an increase in the circulation of money leads to an increase of the level of prices and to loss of the value of the currency. The policy corollary is that states should not emit money at will and based on their needs, but should leave this function to banks who will function more responsibly. Due to its poor assumptions, the quantity theory boasts many failures, which are both quantitative (the equations are not verified, or in other words, “numbers don’t add up”), and interpretative (it reverses the causal relationship between increases in circulation and loss of value to the currency). The most recent such example is the QE’s and Q€’s patent failure to increase inflation even by half a percentage point. In what follows, I will describe an older such case, that of the Greek hyperinflation during the occupation by German forces during World War II. First of all, let’s start by stating that the German strategy consisted in using Greek resources (food, minerals, timber etc) for the provisioning of the North African campaign, where Rommel was fighting to secure access to Middle East oils and control of the Suez canal. Among the tactics used in the context of that strategy was monetary pillaging. As is revealed by statistics of the era,1 the occupation experience in general and the monetary pillaging in particular, shattered the value of the drachma and forced the Germans to speed up the printing process to offset the resulting loss in seignorage. In April 1941, just before the German invasion, despite the fact that the monetary circulation was distinctly increasing due to the war effort (starting by the Italian attack on October 28, 1940), there was a marked stability in the price of the golden sovereign (1,063 drachmas) and the consumer price index in Athens (CPI = 116). In particular the rise of CPI was just 8.41% with respect to the previous April. However, following the invasion, the gold sovereign jumps to 4,930 drachmas in May and the CPI starts a steep upward trend that would land it to 1,009 in November (755% rise with respect to November 1940). At the same time, monetary circulation had barely doubled. Clearly, we cannot consider the increase in circulation as the cause for those increases. The only other notable event was... well the German invasion. We can briefly say that Greeks, fearing the foreign occupation, hoarded goods. Foodstuffs were taken away from the market under the fear of shortages and gold, which was considered a stable value was demanded in payments. With the markets drained of goods and with gold infiltrating in exchanges, the demand for drachmas collapsed and its value went along with it. The “flight from the drachma” began. The actual experience of the German occupation made things worse. Greek goods were in essence requisitioned by Germans and Italians under the guise of exports through the technique of clearing—through the German Degriges and the Italian Sagic companies. Greek “exports”—if one could consider them as such—contributed absolutely nothing to the Greek trade balance. Trade deficits gave drachma its coup de grâce, as there was no demand for it left even in the forex market for the purchase of Greek exports. But how was the monetary pillaging carried out with a collapsing drachma? It was very important for the success of the German venture that the requisitions of the products be carried out smoothly, with producers and merchants considering that it was trade as usual. In the beginning (April-July 1941) the German and Italians used their own credit notes to carry out payments. Merchants would then exchange them for drachmas at the Bank of Greece (BoG). On August 1941, the occupation forces agreed to stop this practice and use drachmas directly, which consisted in them “ordering” fresh drachmas from the BoG itself. When the BoG’s supply ran out—its own printing facilities were not yet operational—they mobilised private printing houses to keep up the supply (Papachrysanthou, Aspiotis-ELKA, Karydis, Pechlivanidis). In other words, the increase in circulation was the effect and not the cause of price increases. Statistics confirm Christidis’ claims, showing the increases in the price of the gold sovereign and of the CPI preceding the increases in circulation. This view is also supported by the efforts of Hermann Neubacher, special economic plenipotentiary of the Reich in Greece, to prop up the drachma by gold sales at the Athens stock exchange (ca. 1.3 million gold sovereigns after November '43). This tactic reveals the importance that the occupation forces ascribed to the purchasing power of the drachma, because it directly determined the seignorage they could derive from fresh printings. They didn’t care about the health of the Greek economy, but they aimed to keep the cow alive just a little bit longer so that they could keep milking it. Rommel hold tight or we’re lost! And all these despite the exponential increase in circulation still underway. In conclusion, the drachma was not destroyed by an irrationally expansive monetary policy of the national government. The drachma was destroyed by a foreign occupying force, bent on sucking every single asset from the Greek economy to support its war effort. The consequent collapse of the trade balance, combined with the Greeks’ psychology, tanked the demand for drachmas and caused the demand for goods to skyrocket. The value of the drachma was annihilated. The printing presses just followed. 1 The statistical data are found in the reports of the High Economic Council, the Joint Relief Committee (Delivanis and Cleveland 1949), and from the reports of the Governors of the BoG and the Greek Statistic Service (ESYE). The statistic processing was carried out by the author (Μπούνταλης 2016). Delivanis, Demetrios, and Willian C. Cleveland. 1949. 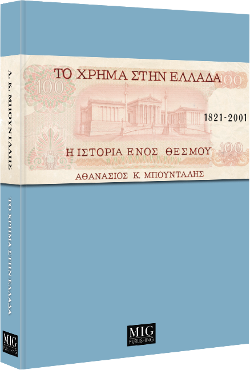 Greek Monetary Developments 1939-1948. Bloomington Indiana: Indiana Univeristy Publications. Χρηστίδης, Χριστόφορος. 1971. Χρόνια Κατοχής, 1941-1944: Μαρτυρίες Ημερολογίου. Αθήνα: Αυτοέκδοση (Christidis, Christophoros. 1971. Years of occuparion, 1941-1944: Diary testimonies. Athens: Self-published).